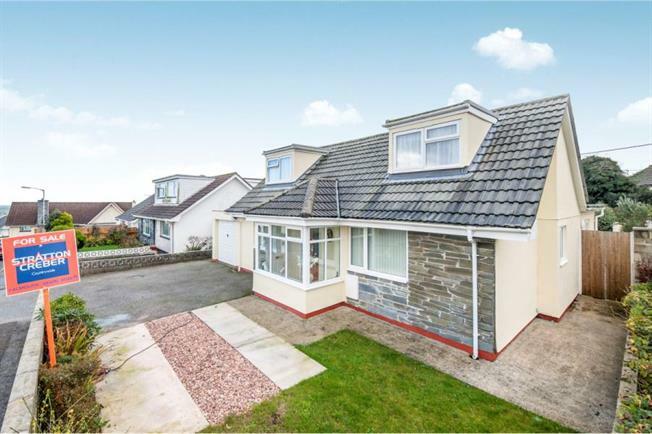 4 Bedroom Detached Bungalow For Sale in Penryn for Guide Price £358,900. A THOROUGHLY APPEALING DETACHED THREE/FOUR BEDROOM dormer bungalow over TWO FLOORS that has been extended to provide incredibly deceptive accommodation within. The ground floor layout has been created to provide very sociable areas, in fact, it is so well planned it would easily lend itself for a dependant relative to live quite comfortably alongside other family members. Two further bedrooms to the first floor with the master bedroom having an en-suite. The thriving village of Mabe is located just under 2 miles from Penryn and is less than 3.5 miles from Falmouth. It boasts a good range of day to day amenities including a public house, hairdressers, convenience store with sub Post Office, village hall, a well respected junior school and enjoys regular bus services to the surrounding area whilst the rapidly expanding university campus at Tremough is approximately 1 mile distant. Viewing is a must to fully appreciate what is on offer. Double glazed to all sides allowing plentiful natural light to enter, low level wall with UPVC window sill, tiled flooring door to entrance way. Turning stairs rising to first floor landing, generous area for coat hanging, under floor heating and door to inner hallway. An L-shaped hallway, under floor heating with doors off to kitchen/diner, living room, bathroom, boiler room and ground floor double bedroom. Another generous light room that benefits from double glazed window to side aspect, French double glazed doors to rear garden, further door to conservatory, attractive double glazed lantern style roof with a further window to the side and under floor heating. A great addition to the property providing plenty of space over looking the rear garden, this Edwardian style conservatory has under floor heating, tiled flooring with light and power points. Spacious room with under floor heating, French internal doors to conservatory and further door to utility room/2nd kitchen and inner hallway. A much larger than average utility room, could be used as a second kitchen, double glazed door and window to rear aspect, window to side aspect. Range of wall and base units with roll top work surfaces above, stainless steel sink with drainer, space for washing machine, dryer and fridge, tiled flooring, radiator and internal door to garage. White bathroom suite comprising shower bath with glass shower screen, WC, sink with vanity mirror above and built in vanity unit below, heated ladder style towel rail, extractor fan and tiled flooring with under floor heating. A generous double bedroom with under floor heating, double glazed window to front aspect. Currently being used as a formal dining room, double glazed window to front aspect, under floor heating. A superb walk in boiler room housing the floor standing Worcester boiler, Megaflo cylinder, recycling pump and plenty of storage space. Velux window to rear aspect allowing plentiful natural light to enter, eave storage, doors to first floor bedrooms. reducing to 2.87 including built in wardrobes. A double aspect room with double glazed window to front and side taking in the views, part sloping ceiling with some height restrictions, two radiators, generous fitted wardrobes with an open dressing area, door to en-suite bathroom. Attractive room with sloping ceiling, some height restriction, built in wardrobe, radiator, double glazed window to front aspect, velux window to rear. Rear gardens are south facing and delightful, private, low maintenance with low level walls, raised planters, lawn and paved areas with an attractive decked area all being ideal for sitting out and entertaining. The property also benefits from side access.